.1. What was your first Western novel or story and was it published? The first book I wrote was Comanche Flame. It was published after several rewrites. My first published book was Reckless Heart. I wrote 3 sequels (Reckless Love, Reckless Desire, Reckless Embrace). It won The Romantic Times Reviewer's Choice Award for Best Indian series. I read a lot of western fiction when I was growing up....I don't recall any one of them being more influential than the others. Being a woman and a romantic, I'd have to say the scene in Hondo when John Wayne takes Geraldine Page in his arms and kisses her. Shane. I still have that old paperback book. I was so disappointed in the movie. Alan Ladd was the worst actor for the role. He was too short, too blond, and looked nothing like the dangerous man-in-black on the cover of the book. That's one movie I wish they'd remake! Although I'm not sure anyone could replace Jack Palance. Crazy Horse. His story fascinates me. As much as needed. I used to go to the library. Then I started buying books. Now I do a lot of it online. I think it's very important. You can't really tell the story without the proper background and setting, whether you're writing western or vampires. Hmm, good question. Usually the beginning just comes to me. The main one I remember is from a book titled Midnight Fire. The line, He was dying and he didn't care" came to me out of the blue. I wrote it down (because if you don't write them down immediately, you forget them!) and then sat down to find out why he was dying and why he didn't care. I use prologues from time to time, as needed. I do it as I go along. Of course, sometimes I get so lost in it that my writing suffers. I love all my heroes. The role model for most of them is Eddie Little Sky. Eddie used to dance at the Indian village in Disneyland many moons ago. As a young girl, I was intrigued by him. My books are more romance than western, but I guess basically traditional. Except for my time travel books, which are really fun to write, whether I'm sending a modern man or woman back to the 1800s, or bringing them into the future. Most of my heroes are Indian or half-Indian because of the impression Eddie Little Sky made on me. When the words don't come, I go do something else. I can't think of a bigger waste of time than staring at a blank computer screen. You know that's like asking a mother to pick her favorite child, don't you? I guess it would have to be Shadow, from my Reckless series. 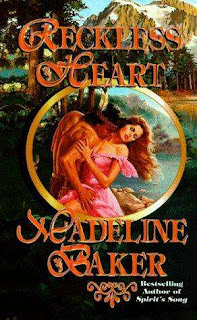 I liked him so much, I wrote 3 other books because I couldn't bear to say good bye :) A close second is the hero from The Angel and the Outlaw, which is a time travel book. J. T. Cutter is an outlaw, and I've always had a thing for bad boys. Hondo from the movie of the same name. Except for the discrimination against Indians by whites in the old west, I tend to stay away from social issues. Not more. But I have written a few short stories that have gone straight to Kindle. Writing is my day job. And my afternoon job. And my night job And the only one I want. The pay is fair, the hours are flexible, and I can write in my PJs. Since I no longer have a publisher for new westerns, I'm writing vampires as Amanda Ashley. EC Blush is publishing many of my old out-of-print books. And Amazon will be publishing some others. Probably more vampires.....although I'm currently working on a western set in Deadwood. As far back as I can remember, I've loved cowboys, horses, and Indians. One night, when my husband was at work and my kids were asleep and I was bored, I started to write a book. I had no intention of even publishing it, or letting anyone else see it. 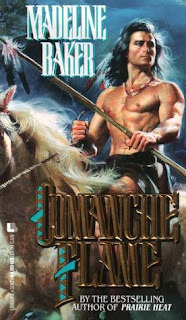 I lived that book (Comanche Flame) day and night, and when I finished it I wrote another. And another. It wasn't until a friend of mine read one of my manuscripts and persuaded me to look for a publisher. It took six years and 31 rejections, but I finally sold Reckless Heart. I've been writing, and loving it, ever since. Speaking Volumes has dropped the price of Robert Randisi aka: J.R. Roberts' Gunsmith #1: Macklin's Women, Angel Eyes #1: The Miracle of Revenge, Mountain Jack Pike, and Tracker: The Winning Hand ebooks to a reasonable $2.99. 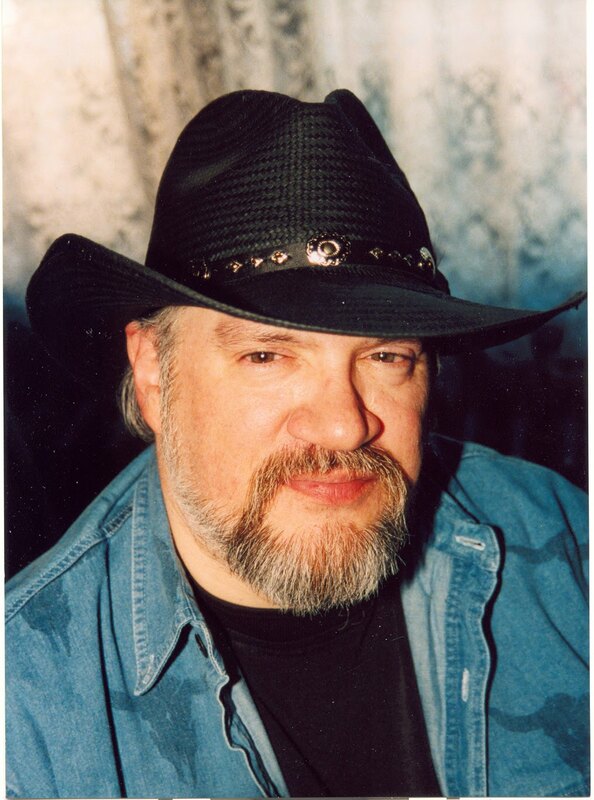 J.R. Roberts (Robert J. Randisi) writes western novels and is the author of the Gunsmith series that consists of more than 320 novels and over 10 million copies in print. His first book and the first in the series Macklin's Women was published in 1982 by Jove Books. Most writers of my acquaintance have been at it for a long time. They claim they wrote their first story at age nine or thereabouts and haven’t stopped writing since. Many say they “must” write, and suffer some sort of withdrawal when not tapping away at the keyboard. I spent the first 45 years of my life with no notion of writing a poem or a story or anything else we usually call creative writing. Other than the routine stuff in required English classes, I’ve never had any education or formal training in creative writing. That said, I suppose I have been blessed with the ability to string words together. But it has always been with a purpose in mind—essay questions on tests, writing for school newspapers, and the like. And, since graduating from college with a degree in Journalism back in the mid-70s, the purpose has been business—writing advertising copy of all kinds. Other than a few essays for advertising trade magazines and such, that was pretty much it. Then, one day in the mid-90s (the decade, not my age—I’m not that old, yet) I wondered if I could write a poem. A cowboy poem to be specific. You see, I grew up in a cowboy family in a small town and spent a good part of my youth horseback, and a lot of time feeding, branding, and otherwise tending cattle. Cowboy stuff—real cowboy stuff, not that nonsense on TV and in movies—was a big part of life where I grew up. Like a lot of kids then and there, the rodeo bug bit me, and throughout high school and college and for a time afterward I spent most every spring and summer weekend straddling the bucking chutes at rodeo arenas around the West, climbing onto the backs of horses called broncs whose only function in life is to eat hay and buck off cowboys like me with the temerity to think they can’t. There may still be depressions the size and shape of my head in several rodeo arenas that attest to that fact. I tell you this only because the addled brain that resulted is responsible, more than anything else I can remember, for my (eventual) taking up of the pen to write for fun, rather than work. As a lifelong member of the cowboy culture and longtime fan of cowboy poetry, it’s only natural, I suppose, that when I wondered if I could write a poem, that would be the kind of poetry I would attempt. And, given my appreciation for rodeo, it’s no surprise that a lot of the poems I wrote (and still write, on occasion) use rodeo life as their subject. Not knowing any better, I assumed the reason one wrote poems was to get them published. There were, at the time, a couple of national and a few regional magazines edited for Western enthusiasts that published poetry either regularly or occasionally, so I started sending them poems. And, much to my surprise, they started publishing them. Other poems made their way into anthologies. Which only spurred me on. I managed to get enough poems published to qualify for membership in Western Writers of America, where I met lots of real writers who knew what they were doing and were kind enough to offer advice and encouragement. That, along with the same curiosity that led to me to write a poem (and the addled former-bronc-rider brain that allows such ill-considered notions to pass through unfiltered), made me wonder if I could write a short story. So I did, and several of my stories have been published in Western anthologies. I tried a novel and that was published. Then another, and that was published. A couple of nonfiction books got written and published. A collection and a chapbook of poetry. A bunch of magazine articles. Some book reviews. A series of essays on writing poetry for CowboyPoetry.com (in which I pretend to know how to write poetry). And so on. All in all, writing has been a pretty smooth ride, compared, at least, to riding broncs. I’ve been lucky. Most everything I’ve written has been published, by everybody from well-known New York imprints to unheard of art-house presses. One of my short stories was even a Finalist for a Western Writers of America Spur Award back in 2006. 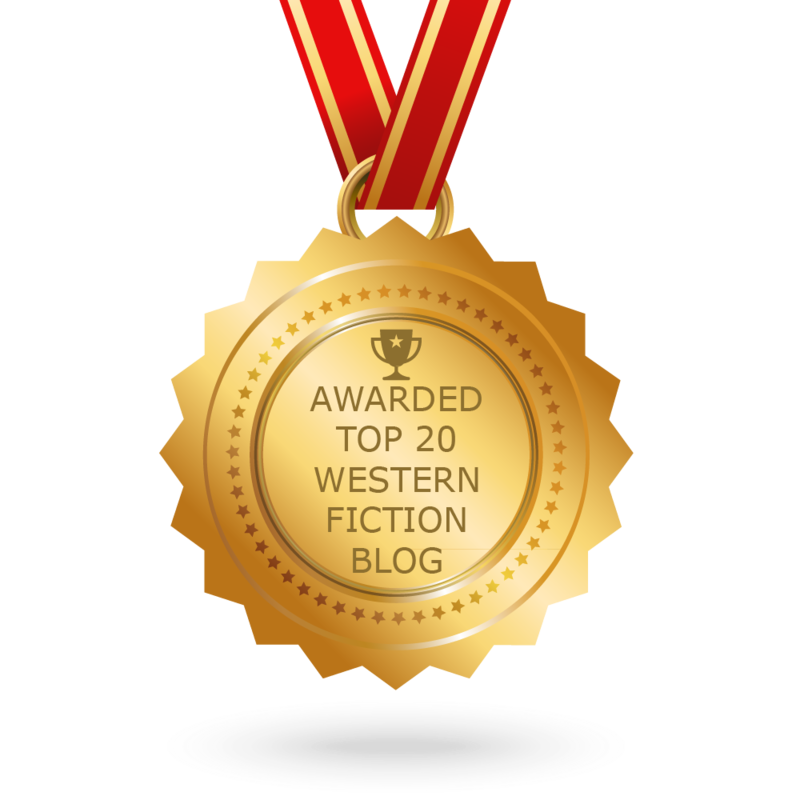 A recent short story, “The Death of Delgado,” from the anthology The Traditional West, won a 2012 Spur Award for Best Western Short Fiction and was a Finalist for a Western Fictioneers Peacemaker Award (as was my novel, The Assassination of Governor Boggs). A 2012 Spur Award for Best Western Poem for a piece from my collection Things a Cowboy Sees and Other Poems also came my way, and the book won the Fred Olds Poetry Award from Westerners International. Who knows what the future holds? I write for fun (and occasionally for profit), but do not feel compelled to do so and, thank goodness, don’t rely on the income to pay my bills (advertising still does that). So, I write whatever seems interesting and enjoyable at the time, then figure out who might want to apply ink to it. At the moment, I’m awaiting publication of a third novel (Cold as the Clay) that’s due out anytime now From High Hill Press/Cactus Country Books, and there’s a fourth novel in the hands of a publisher awaiting rejection. A nonfiction pictorial about westward migration and settlement, Go West: The Risk & The Reward, is slated for October release. And there are a few poems and stories, a novel, and a nonfiction book either in progress or awaiting attention. I’ll get to them, as soon as I find the time and the inclination. Finally, while I came to writing late and took an unusual road, I like it here. It’s a whole lot easier than getting bucked off ornery broncs. And at least as much fun. Rod Miller is among the original members of Western Fictioneers. 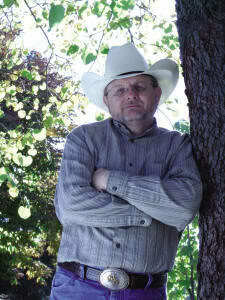 He is Membership chair and serves on the Executive Board of Western Writers of America. Visit www.writerRodMiller.com for more information. 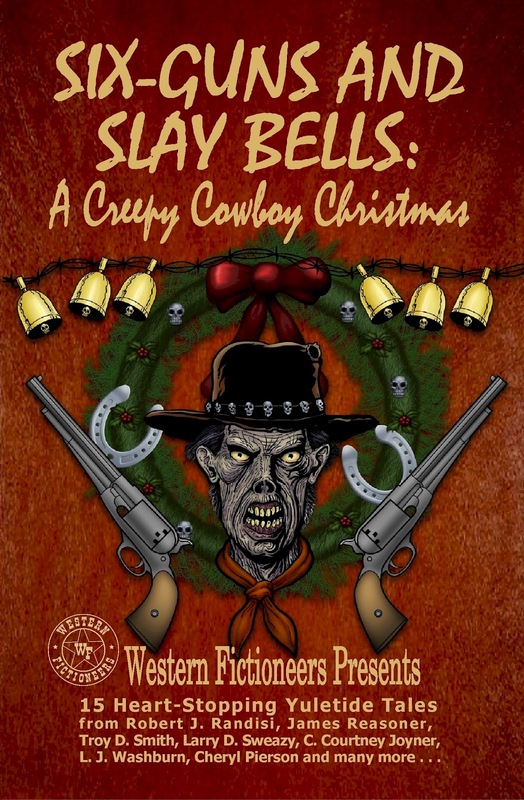 According to this entertaining collection, Christmas in the Old West includes ghostly saloons, cryptic phrenological snake-oil salesmen, nightmarish men in black, ferocious Apaches, and ornery drunks. In Douglas Hirt's "Christmas Wraiths," tall tales turn true. A Texas Ranger and Santa Claus (calling himself Pop Edmunds) team up to defeat desperadoes and please children in James Reasoner's "Presents for One and All." The West is the staging ground for the eternal battle between good and ill in Cheryl Pierson's "The Keepers of Camelot." Even a monster helps secure justice in L.J. Washburn's "A Creature Was Stirring." The spirit of giving finds an impressive incarnation in Charlie Steel's "Joshua's Voice," in which human influence on the western landscape poses somber questions about the Great Frontier and extends the reach of this seasonal collection. 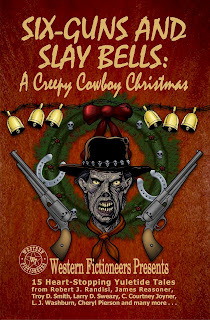 Six-guns and Slay Bells: A Creepy Cowboy Christmas will be available October 31st in Trade paperback ($12.00), and for Kindle ($2.99) and the Nook ($2.99). Western lovers, get out your comfy slippers and your lounging coat and ready yourself for an evening’s read that may take you into the night. Meet Wolf Creek. And I say meet Wolf Creek on purpose. Because this is a novel of a town. It takes its name from the creek that runs just south of town and on into the Arkansas River. It’s a real town. Not real in terms of being an actual town, but it’s real. And as you read, you’ll get to know and hate some dastardly characters, and know and love others who, though flawed, try their level best to do the right thing. Meet the town doctor. Logan Munro. Veteran of three wars the British colonial empire fought in the mid-1800s, and friend of Florence Nightingale. When he appears, he appears bloody. 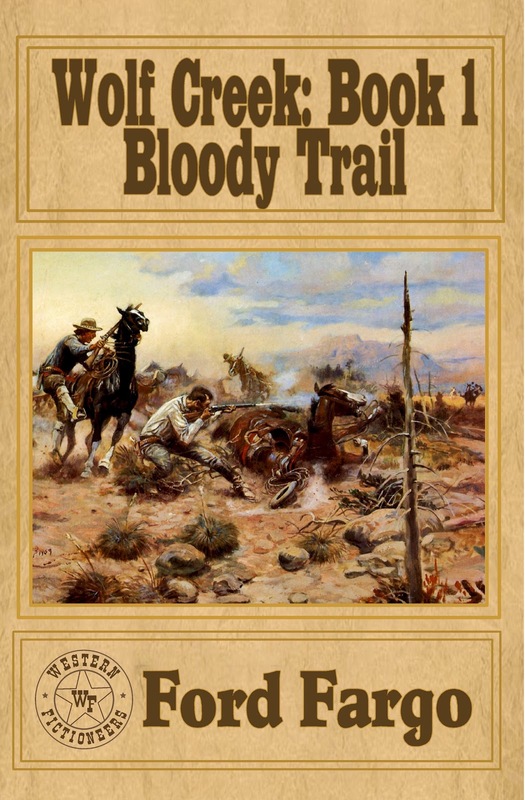 But the blood on his chest is not the blood from which this novel gets its name—Bloody Trail. Meet Ma’s Café, the place where a man can get a man-sized breakfast. And Kloepfer’s butcher shop, which offers prime cuts in season, buffalo included. Meet Sam Gardner, former cavalry officer and marshal of Wolf Creek, and Fred Garvey, a no-nonsense deputy who sticks to the letter of the law. Meet Liu Chiao and Li Wong, owners of an opium parlor and a laundry, respectively. There are many more to meet, and you will become more and more familiar with them as you continue reading Wolf Creek books. Now meet Jim Danby, a former Quantrill raider who defines his own finest moment as the raid on Lawrence, Kansas. He and his riders sit outside Wolf Creek, waiting for the signal to begin their raid. And if you think Lawrence was bloody, just wait. Danby’s raid is carefully planned. Explosions and fire cut the town in two. Groups of armed riders charge through the town, shooting every horse they see and firing at Wolf Creek citizens at will. The raid lasts minutes. The trail of dead and dying left behind gives more meaning to the word “bloody.” The schoolmistress is dead. One of her tiny charges is dead. A deputy lies in his own gore. Wagons burn. Businesses and shops are pillaged. And the Wolf Creek Savings and Loan loses two tellers and two saddlebags full of greenbacks. But frontier towns like Wolf Creek are not populated by namby-pambys. The raiders rode away with fewer men than they came in with and some wounded as well. Nor are the hardy folk of Wolf Creek willing to let them off scot free. In minutes, Sheriff Satterlee’s got a posse together and they ride. They ride with the sheriff in the lead. Doc Munro joins. Bill Zachary, Spence Pennycuff, Jimmy Spotted Owl, Spike Sweeney, and Robert Gallagher, a store clerk, join. Bill Torrence—pacifist, horse lover, livery owner, would-be suitor of the now-dead schoolmarm, and ex-Texas Ranger—joins. Charley Blackfeather—half black, half Seminole, all seasoned scout—joins. Three cowboys join. Fourteen men ride . . . straight into an ambush. But Wolf Creek’s riders give better than they take, and while they lose men, the ambushers become the hunted. The posse rides on. And on. Secrets come out. Deeper friendships are made. True characters of men finally appear. And Danby’s raiders meet a bloody end in the Indian Nations. This is an adventure written by several Western Fictioneers authors, the best the genre’s got, dead or alive. This is a short novel. Know why? It only introduces Wolf Creek and its citizens. Yes, it reaches a satisfying conclusion. But you end up sitting on the edge of your chair reaching for the next volume. While a handful of authors wrote this book, the story fits together well. While there are differences in style, they fit together well. 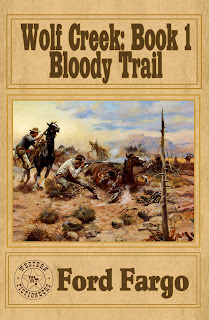 And while Bloody Trail is a fitting beginning to a new series, it also promises many more rousing stories to come. While one of my characters, Billy Below, has a walk-on part in this book, I personally did none of the writing. As the stories develop, I’m sure you’ll see this happen a lot, as the citizens of Wolf Creek will become familiar to us all, and we will be able to call on them in supporting roles to our own characters. Kudos to Troy and his team of writers for Bloody Trail. Well done.